Do you know who the kings of content are? They’re the copyright owners. They have the right to decide how the work will be used, copied, and distributed. You are essentially handcuffed in how you use the content. Most of us recognize that we can’t just find text and images on the web, then cut and paste them to our own website. But too many people, including so-called marketing experts, think as long as they cite the borrowed content’s source and link to the original, it’s OK to use. Or they think that if they hire a photographer, they own the images and can use them any way they want. They are wrong. The copyright owners have the exclusive right to control where their work is copied, distributed, and displayed. The copyright owners decide which legal recourse they will pursue. The first notice you may receive about the alleged copyright infringement could be a lawsuit. And the fact that you didn’t understand copyright law will not protect you from the legal consequences, even if you apologize. If you work with a third-party content creator (writer, photographer, videographer, etc. ), take steps to secure ownership or licensing rights in your written agreement with the contracted individual or agency. Ideally, you want a contract that gives you copyright ownership of everything created by the third party. If you do secure full rights, consider detailing in the agreement that the third party can use a copy of the creation in a portfolio. If you are negotiating the details with the third party, consider terms that transfer copyright ownership once the creator has been paid in full. What is the contractor creating? How will changes to the project be handled? What are the deadlines and deliverables? How and when will the contractor be paid? Who will own the copyright for what the contractor creates? If the contractor creates or provides something that leads to the accusation of legal wrongdoing, will the contractor indemnify you and be responsible for your legal fees and damages? Under what circumstances can either party terminate the contract? If a legal dispute arises between the parties, how will it be resolved (i.e., mediation, arbitration, or litigation)? In what city or county will the dispute resolution process take place? Which state’s law will apply? If you work with these parties on an ongoing basis, revisit your agreement annually to make sure the contract fits the scope of the relationship and current law. Note: If you already have contracts with your outside content creators, update them to secure copyright ownership or scope-of-use permission going forward. But, also seek copyright ownership of previously created work. You likely will have to purchase those rights when you amend the original agreement. While there are plenty of free independent-contractor and work-made-for-hire contract templates available online, this is not a time to skimp on quality. You can use these templates to get ideas for your contract provisions, but you shouldn’t use a contract to outsource your content creation unless it’s been approved by your intellectual property attorney. between businesses and the third-party content creators they hire. When you secure an image or content from a professionally run website, you agree to its licensing terms. Make sure you understand the rules you have to follow in using the properly acquired image – even when it’s free. In some cases, you may be purchasing one-time rights to use the image or may be prohibited from altering the image in any way. 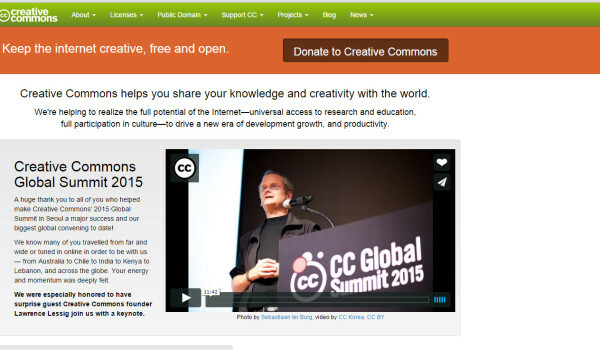 TIP: Flickr, a user-generated image community, built Creative Commons licensing options into its interface. Users who share photos can do so on their terms, including giving their permission for free, legal sharing, use, and remixing. As such, it has become a leading resource for free, legally shareable images. TIP: If you find the perfect image but it doesn’t have the proper Creative Commons license, reach out to the copyright holder and ask for permission. Now that you know about the value of copyright ownership and how to secure those rights, you can take steps to prevent legal accusations in the future. Do your best to obtain full copyright ownership. If you have to compromise, know all the potential use parameters and prioritize the ones most important to your existing content marketing strategy. The end goal is to have an agreement that ensures you’re truly the king of your content. Now that you have the proper rights to your content, learn how to get more readers for that content with the best techniques for creating captivating headlines. Read CMI’s e-book, How to Cook Up a Killer Content Marketing Headline. 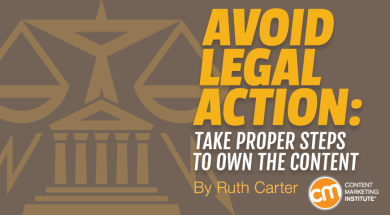 Ruth Carter is a licensed attorney in Arizona with a practice that focuses on intellectual property, social media law, business startups and contracts, and flash mob law. She is the author of three best-selling books on the legalities of guerrilla marketing and social media including The Legal Side of Blogging: How Not to get Sued, Fired, Arrested, or Killed. Ruth is active on Twitter @rbcarter, YouTube, Facebook, LinkedIn, and Periscope.